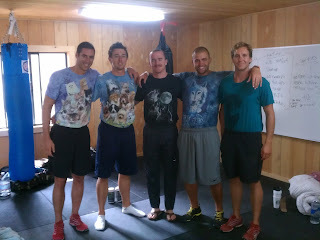 Vote for the best Animal shirt in the comments! When you’re new to training/ramping up your training/waking up earlier/pushing yourself to the next level mid-WOD, it’s shocking to your body. Your body tells you to quit, to give up and do something easier– like sit down and catch your breath, or just go slower. It’s easy to eat garbage or just not go to the gym. But after you force yourself to workout a hundred or a thousand times, after you ignore the desire give up every workout, you get to a point where you forget that quitting is an option. It’s not that you’re ignoring the voice in your head that tells you slow down, it’s not that you are resisting the urge to quit. It’s that you’ve ignored that voice and resisted that urge so many times that you have completely forgotten that stopping is even possible. You’ve temporarily forgotten what it means to quit. If you know what I mean, then good for you. If you doubt, don’t worry, you’ll get there. Just be persistent, come to the gym when you’re supposed to and make yourself finish every workout– even if you’re the last one done. Don’t let yourself be a quitter and before you know it, you’ll forget that quitting was ever possible.